The Stihl weed eater is an edger and trimmer with an excellent reputation for quality and durability. 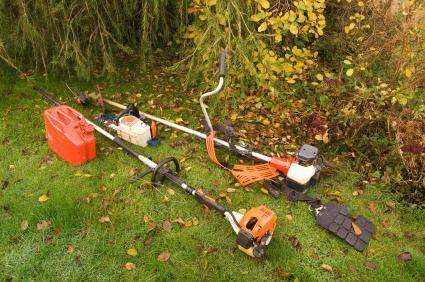 Manufactured and sold by the Stihl Corporation of Virginia Beach, USA, Stilh power tools and weed trimmers are sold nationwide at over 8,000 large home and garden centers and hardware stores. Because there are so many different models, Stihl offers a unique and useful interactive product selector on their website. Questions begin by narrowing down the intended use, frequency, and strength required. The results list appropriate models. Even Stihl's basic weed eaters can be used for light brush cutting, although you might want to upgrade to a more robust machine if you know you'll need to cut heavy brush or thick and tall weeds frequently. One of the unique characteristics of the Stihl weed eater is Stihl Quiet Line, a special cord made just for the Stihl company. Weed eaters and edgers use a cord that whips around at extremely high speeds to chop away grass or weeds. Stihl Quiet Line is created from a proprietary formula of polymers to make it flexible, durable and quieter than others on the market. The different types of Stihl cords or trimmer lines are color coded, so buying a replacement is easy - just know whether your machine takes blue, red, or another color and grab a package marked with the corresponding color. Selected models are equipped with Stihl's Easy2Start system. The pull cord needs less strength to pull back to start the motor. This is helpful for anyone whose upper body strength is compromised or who cannot easily start a traditional pull-cord on a mower or trimmer. Many companies claim that their power tools have an ergonomic design, but certain features on Stihl weed trimmers really do help with the user's posture and comfort. The Stihl FS46 Trimmer, for example, is made with an extra long shaft so that tall users don't have to bend down and hurt their backs while cutting weeds. It's just one of the many features that make Stihl power tools a gardener's best friend. Unlike the Ryobi weed eater, which sometimes gets mixed reviews, consumer feedback on the Stihl models is overwhelmingly positive. Customers cite the ease of use, friendliness of the local dealer network, and excellent cutting power of the equipment. Of note is the service received during the purchase; this may be due to the fact that Stihl works with small time, old fashioned mom and pop and midsized hardware stores, where other big overseas manufactures sometimes work only with one large chain of stores. Small stores often offer better service than big box stores. Another plus when buying a Stihl product is the fact that it's a United States based company. While other companies have taken their manufacturing jobs overseas, Stihl has consistently expanded within the United States and now boasts 2,000 jobs ranging from customer service to manufacturing. Since its founding in 1974, chairman Hans Peter Stihl and the company's management team have kept the attention of the entire company focused on durability, reliability and quality, attributes that have propelled the company into success.